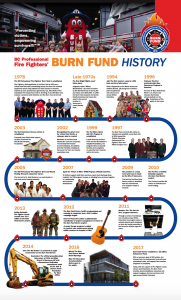 Four decades ago Fire Fighters visiting patients in the Burn Unit saw a critical need and started contributing money for Burn Unit medical equipment and to help patients on their journey to recovery. Inspired by such spontaneous generosity, Captain Alex Blake from the Coquitlam Fire Department proposed a province-wide initiative……And the BC Professional Fire Fighters’ Burn Fund was formed. 2014 – Ground Breaking Ceremony of the BC Burn Fund Centre . Construction begins! 2017 – Endowment Fund launches with $ 2 million start, with a Goal of $10 Million.